September 2018: Japan’s MINERVA-II-1 and 2 rovers land on Ryugu. 03/10/2018: MASCOT lands on Ryugu. 14/08/2018: primary and back-up landing sites for MASCOT selected at CNES in Toulouse with the MASCOT science community and Hayabusa2 representatives. Summer 2018: characterization of the asteroid. 27/06/2018: the mission arrives in the vicinity of asteroid Ryugu. December 2016 - April 2017: second phase of continuous ion engine operation. 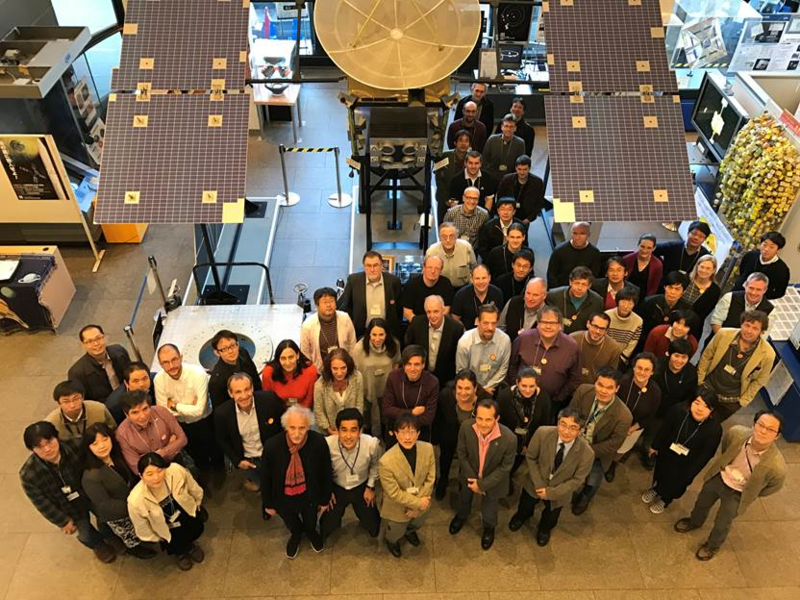 12/01-12/02/2016: Meeting of Hayabusa2 scientific team at Jaxa. 11/08-11/12/2016: Calibration tests for the on-board experiments. DLR Lander Control Center engineers in Cologne switched on the 4 instruments on-board the shoe box-sized lander, in order to test the calibration of the experiments. The instruments had a nominal behaviour. 12/03/2014: Successful Launch of Hayabusa2! Late in 09/2014: Departure of Hayabusa2 for Tanegashima launch site. In Japan: MASCOT Qualification Model participates to the Thermal vacuum tests while integrated to Hayabusa2. At DLR: Thermal vacuum tests of MASCOT Flight Model (FM) before delivery to JAXA. The FM will be integrated to Hayabusa2 before the vibration tests.